A NEW 20mph speed limit is set to be introduced on a busy road used by drivers travelling between Fishponds and Downend. Overndale Road links Downend Road and Bromley Heath Road, and is used by thousands of drivers each day. Many use it as a route in and out of Fishponds from the Avon Ring Road. Parts of the road are relatively narrow and queues can build up as drivers wait to pass parked cars. Now South Gloucestershire Council is planning to introduce a 20mph limit on part of the road which runs outside a school. It will also install speed bumps on the road, to force drivers to slow down in the area covered by the zone. The section of road where the existing 30mph limit will be reduced is between the Croomes Hill/Frenchay Road double mini-roundabout junction and the T-junction with Cassell Road. In addition, Bristol City Council is expected to make the part of the road inside its boundary, from Cassell Road to Downend Road, a 20mph zone. The city council’s section of the road includes Gracefield Preparatory School. South Gloucestershire says the move is in line with a resolution it made five years ago to ensure that, “as far as practicable, all schools in South Gloucestershire are covered by a 20 mph speed limit”. The school covered by the planned 20mph zone is the Pathways Learning Centre, a pupil referral unit for around 50 children aged between five and 16 who are unable to attend mainstream schools. 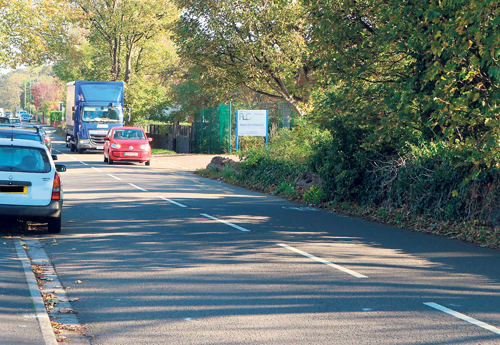 Explaining the proposals, the council said in a statement: “The purpose of the scheme is to reduce traffic speed in the vicinity of Pathways Learning Centre, which will improve road safety for vulnerable road users as well as making walking and cycling to school more attractive. The “speed cushions” will be placed in sets of two across the width of the road. They will be 3.1m (10ft) long and 7.5cm (3in) high. The council has held a consultation on the proposed 20mph zone. Unfortunately the consultation was only announced as it opened, after the previous edition of Downend Voice had been published. It was due to finish on October 26. The authority plans to introduce the new 20mph zone and install the speed bumps by the end of April next year.